Bryant McIntosh scans the court. The senior guard and the Wildcats will take on La Salle in the Hall of Fame Tip-Off on Friday. 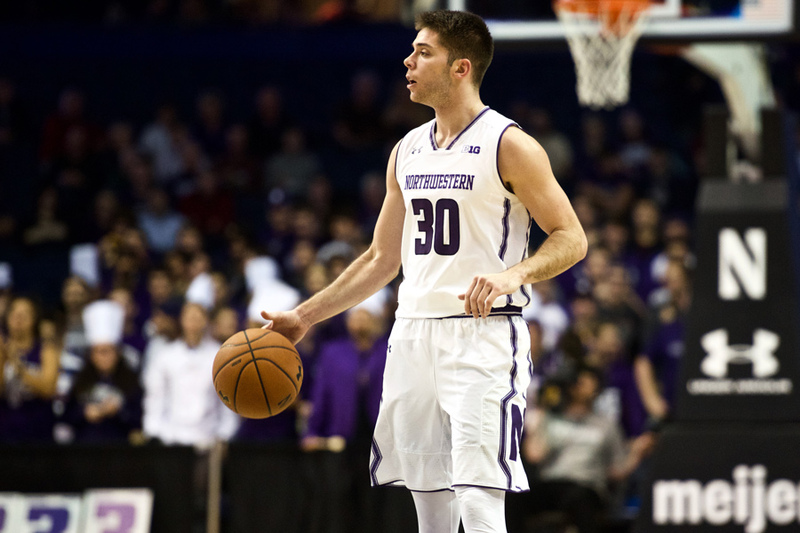 Northwestern’s nonconference slate has not opened as planned. The No. 20 Wildcats (2-1) pulled out ugly wins against overmatched squads in their first two contests and then fell flat defensively in a shootout loss to Creighton (3-0) on Wednesday. For a team looking to set the bar higher after its first-ever NCAA Tournament appearance last season, the sluggish start has left much to be desired. NU will now turn its attention to the Naismith Memorial Hall of Fame Tip-Off, where it will face La Salle on Saturday. Depending on the Cats’ result, they’ll play either Texas Tech (2-0) or Boston College (3-0) on Sunday. If NU wants to be successful at the tournament, it’ll likely take a much better defensive performance, as the Cats allowed 92 points to the Bluejays on Wednesday night. “If you don’t stop the other team, it’s gonna kind of be difficult to win,” senior guard Bryant McIntosh said after Wednesday’s game. After NU hung its hat on defensive consistency during the magical run to March Madness a year ago, the Bluejays’ scoring total represented a difficult pill to swallow. Creighton’s 92 points easily eclipsed any opponent’s final output against the Cats last season. The performance could not have been what coach Chris Collins envisioned when he talked in the preseason about adjusting goals. NU can no longer go undefeated at home after the loss to Creighton at Allstate Arena, the team’s temporary home court. But the rest of those objectives remain for a team that also flashed offensive potential in the loss. And though the wins over Loyola Maryland and Saint Peter’s proved uneven, they did have bright spots. Senior guard Scottie Lindsey scored 26 points against Loyola. Junior center Dererk Pardon displayed an ability to get to the line in the team’s first two games, taking 18 free throws. Pardon, who said he bulked up during the offseason, could be a key player for a team looking to establish a post presence. None of those positives will mean much if the Cats can’t smooth out early inconsistencies, particularly on the defensive end. Loyola managed 23 more points against NU than it did against Fairfield. Saint Peter’s finished with 26 more points against the Cats than it did at La Salle. NU’s next opportunity to reestablish its defensive identity comes Saturday in Connecticut, where it will face the Explorers (3-0). La Salle is led by senior guard B.J. Johnson, who enters the game averaging 21.7 points per game, more than any NU player. Expectations are inescapably higher for the Cats, a fact reflected in their first preseason ranking in program history. Still, the 2-1 start shares parallels with last fall, when NU won its first two nonconference games before falling to another Big East team — Butler. Despite the the bumpy beginning to the season, junior forward Vic Law said after Wednesday’s loss that the Cats are comfortable where they are.